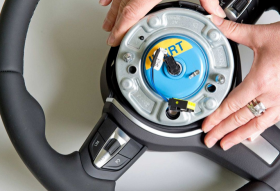 Can Takata survive historic U.S. airbag recall? A worker shows an airbag initiator at Takata Ignition Systems in Schoenebeck, Germany, last year. TOKYO (Bloomberg) -- Unlike industries in which companies have been quick to drop offending suppliers to protect their brands, automakers have largely stood behind airbag component maker Takata Corp., taking the hit to their own reputations from a series of recalls related to the Japanese company’s products that began in 2008. One reason: The tight supply of air bag parts amid the post-recession rebound has left them little choice. Takata commands almost a quarter of the market for airbag inflators --a critical part in a modern vehicle. That loyalty is about to be put to the test. On Tuesday, after months of pressure from U.S. regulators, Takata admitted its products are defective. That triggered regulators to launch a national recall of 34 million vehicles, which likely will become the largest industrywide automotive recall in U.S. history. More important for carmakers, Takata’s rivals are finally ready to boost production of their own inflator products. Others aren’t so sure, given the widespread reports that Takata’s inflators have ruptured during deployment, spewing shrapnel at car occupants, killing six and injuring more than 100. Years of supplier consolidation encouraged by the big automakers has reduced parts supply to a handful of players. Takata and three rivals together control about 80 percent of the global airbag inflator market, estimates Valient Automotive Market Research. Sweden’s Autoliv, which has 25 percent of the market, and Japan’s Daicel, with 16 percent, had been too stretched with capacity constraints to snag business from embattled Takata. But now both are within months of cranking up production. Autoliv says it will be able to make 25 million replacement inflators between now and the end of 2016; Daicel is ramping up a plant in Japan and will begin output in early 2016 at a factory it’s building in Arizona. Even before it doubled the number of U.S. vehicles recalled, Takata was asking carmakers to let it use installments to pay for the cost of replacing defective airbags. CFO Yoichiro Nomura told analysts in May that Takata was meeting bankers almost daily to ensure it has enough cash flow to weather the crisis. The company is also a major supplier of seat belts and steering wheel systems. Takata may need to come up with about 300 billion yen ($2.5 billion) for the airbag recalls, says Yusuke Ueda, a credit analyst at Bank of America Merrill Lynch in Tokyo. That doesn’t include costs to resolve class-action suits concerning the defective parts, which began to be filed last year. The extent of that liability won’t be known for months. Bloomberg's Jeff Plungis and Jeff Green contributed to this report.